So what are CNC drive components? The drive components are the mechanical components that "drive" the CNC machine along its axis. 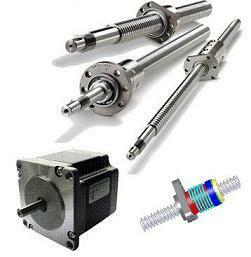 The most common components associated with a drive system, are the motors, lead or ball screw, or rack and pinions. The whole idea of a drive system is to convert controlled rotary motion to controlled linear motion with the help of a CNC Controller. The idea of a CNC drive system is a fairly simple one. However, the actual mechanics evolved can be complicated. This is where many "DIY CNC'ers" get lost when trying to choose the correct drive system for their CNC Setup. The drive system has a direct correlation to the machines capabilities. By understanding the CNC drive system, you have a much better understanding of a CNC machine. Just by changing a few components you can control the machines cutting speed, cutting force, precisions, and accuracy. If you are buying a CNC machine, it is best to know what type of drive components are installed. This will give you a sense of the machines capabilities and life. This is especially true if you are buying a used machine. You need to know what kind of components are installed, how much wear they have, and could you buy replacement parts if needed. This guide offers detailed information on every component that makes up a CNC drive system. If you are building a CNC router, we will discuss money saving tips and options as well as assembly. If the links are greyed out, the pages have not yet been uploaded.